Silicon Valley Solar (SVS), maker of the Sol-X internal concentrator solar modules, announced today that they have finalized an agreement with GSS that will accelerate the market introduction of the company’s Sol-X2 internal concentrator solar modules. The contract defines specific product, process and equipment development that will be executed by GSS to ensure that SVS’s module design can be seamlessly produced on the GSS manufacturing line. “GSS is an integral part of the German solar industry, having won numerous awards and provided innovative solutions for companies such as Conergy AG, Q-Cells AG and Shell Solar GmbH," added Patrick Callinan, CEO of SV Solar. Production samples from the new venture are anticipated to ship in late Q1 of this year, with volume ramping up over the latter half of 2007. GSS has the capacity to produce nearly 100,000 modules per year (16MWp), and it is anticipated that the company will represent a significant portion of SVS’s initial annual production. While Sol-X modules are form, fit and functionally compatible with standard flat plate modules, some modifications are required to utilize a standard PV manufacturing line. This agreement includes an extensive joint development component whereby the SVS engineering team will be working closely with the team at GSS to apply the modifications necessary to adapt the equipment and process to the Sol-X design. SVS has secured a 10MW purchase order, previous post, for the company's Sol-X2, internal concentrator solar modules from Pacific Power Management of Auburn California, one of the state's top solar system integrators, who will begin taking delivery in Q1, 2008. The contract calls for linear shipments of modules over a three year period, with an estimated total value in excess of $35 Million. GSS is a leading specialty manufacturer of photovoltaic modules based in Thuringia, Germany. Established in 1992, GSS has provided solutions for the leading PV companies in Germany and around the world. Part of the East Thuringian Center for Renewable Energies, GSS has engineering, materials and manufacturing expertise with a current capacity to produce 16MWp of solar modules per year. About Silicon Valley Solar, Inc. Incorporated in 2006, SV Solar, Santa Clara, CA, is a manufacturer of flat plate internal concentrator solar modules. SVS was founded by Patrick Callinan, President and CEO of Silicon Valley Microelectronics (SVM). 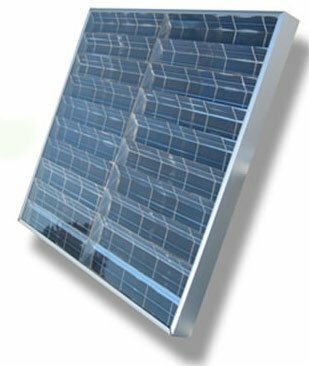 SVM has been supplying silicon wafers and feedstock to the semiconductor and solar industries very profitably for the past 16 years, and created SV Solar as a natural evolution to meet the demands of an increasingly thriving solar market. SVS has developed a unique solar module technology utilizing an advanced internal concentrator, marketed under the Sol-XTM brand.